Every person is different. Every person has gone through a different life journey. Some people go through traumatic events in their lives that can affect them forever. It can lead to how they parent their own children. A parent’s experiences can have dramatic effects on their parenting behavior and children’s development. A daughter could lose her abusive father at the age of six and then her mother at age nine, being thrown into a system and having many trials throughout her life. This kind of unresolved trauma could affect how she parents her children in the future. Just because a traumatic experience is over does not mean it simply ends, because at some point in time the abuse or trauma did happen. It is known to create specific long-term problems that have the ability to disrupt your life. “Parent trauma may affect children’s adjustment both through their parenting behavior and through mechanisms such as vicarious trauma (Riser, 2009).” The hope is that if a child goes through an abuse or trauma that when they grow to become a parent they don’t abuse or cause a trauma on their children. This can have a dramatic effect on children’s mental health and adjustment. There are some things that parents who are raising kids, while still dealing with the lingering effects of their childhood trauma may want to consider doing, since parenting is already a hard enough job as it is. ● “The severity of the event and circumstances surrounding it. ● Whether a close, intimate person to the victim is involved in the trauma as a “persecutor”. ● The person’s circumstances, especially their close relationships at the time. 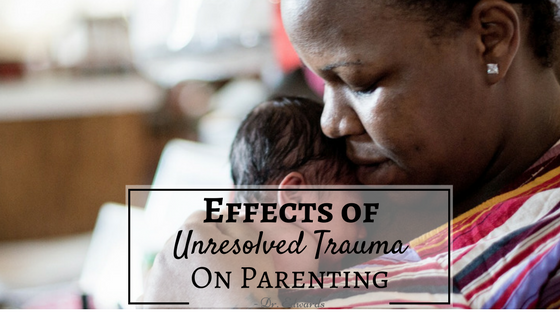 There are many organizations and groups in various states that strengthen traumatized parents’ capacities to respond to their own and their children’s trauma-related emotional reactions. If you are a parent and you are concerned about being the best parent you could be with your children given a traumatic history, then here are a few things you can do to help in your journey. Just like stated above, if you do not get diagnosed and want to self-help, know that not everyone is the same or experience the same childhood. It is smart to consider seeking some sort or therapy, but ultimately up to you. A therapist can provide a safe place that is not judgemental. Whatever your ‘safe place’ is, whether it’s a place or person or thing, know it and embrace it; seek it when you really need it. Everyone makes mistakes. Just because you had an imperfect childhood doesn’t mean you have to be the perfect adult. Everyone has flaws, it is what makes us human. This is what can set you off. Avoiding these as much as possible is what most people will want and try to do, but sometimes it is impossible to avoid. Learning how to dismantle or manage them is always best so you don’t have to worry about when you will break. This is the hardest and most important of all. Healing is the only way to move on. You don’t need to forget, but just live with it and learn how to be happy in your life. However you cope or deal with your trauma, it is important to know that this childhood trauma can shape you, and will likely pave a path on how you guide your own kids, it can still be a bright future. You can be an accomplished, loving parent despite your childhood experiences. This is a wonderful article. As a parent who has lived through trauma, I made it my goal to learn from my experience to strengthen others but especially my children. When we look at our experiences and can improve from them, we can help others in ways that someone who hasn’t had our experiences can. Great article, thank you!